Use Our Free Printable Chore Charts! We've analyzed many kids chore charts over our homeschooling years. Most of them fall into that trap of assigning certain tasks to certain age groups. That didn't work for us. Why? Because my young ones were already doing the chores that were meant for an older group! 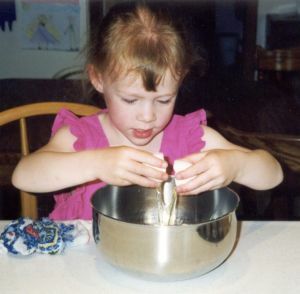 When children are young they want to be involved in whatever it is you're doing. So, let them! You'll be surprised just how fast they learn. 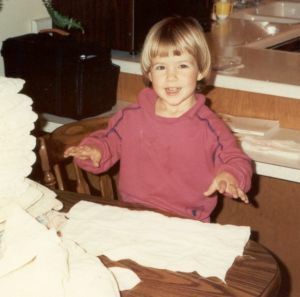 Laura, age 3, folding that never ending pile of diapers! No, they weren't hers! But she loved helping, no matter what it was. Need any homeschool family chore charts? Print one for free! Granted, I will have a reluctant worker once in a while. But the benefits of following through with a chart has its rewards. Can you think of more? Gives them a feeling of authority. And last but not least, it gives Mom more free time. The children take their chores very seriously. So seriously in fact, that they don't even want my help anymore! Now, that's what delegating is all about! Whatever one you decide to use, you will find the handy charts above simple tools for getting those jobs done without paying a kids allowance.